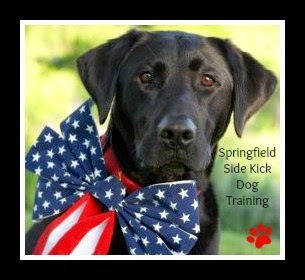 Springfield Side Kick Dog Training Blog: We've Got Your Guide to a Happy & Safe 4th of July! Come along and follow Springfield's Premier Pet Dog Trainer, Misti Fry! For more information on her training, please visit her website! Sign up here for periodic Tips, Tricks and Treats! We've Got Your Guide to a Happy & Safe 4th of July! Happy 4th of July to You and Your Side Kicks! With the July 4th holiday around the corner, fireworks are the biggest concern for all pet owners. Almost all humans with canines in the U.S. declare this day the worst day of the year for their dogs. Veterinarians say that July 3rd is usually the most trafficked day in their offices, with clients coming in to get drugs for their dogs. This year, we can help you make this holiday more relaxing for you and most importantly, your favorite Side Kick, with just a few simple steps that you can do in the comfort of your own home! Start with your dog's favorite place that would ideally be an interior room. Next, collect a few supplies to stock: Favorite toy, bed and treat, aromatherapy spray and perhaps music to drown out the loud fireworks. For rooms with windows, be sure to closing the curtains or blinds. Ensure that you set your dog up for success by surrounding them with items that they enjoy as distractions such as a puzzle toy, Kong with a special treat, plenty of water, a calming collar and/or natural aid supplement and soft bedding and/or a crate if they prefer their house. If your dog enjoys wearing a Thundershirt™ for comfort and stress relief, be sure you have practiced wearing it in advance. Music therapy is a popular tool for humans and animals alike! With the explosive sound of firecrackers, do not be afraid to consider adding some rock'n'roll to your dog's repertoire of classical and other soothing tunes. Just be sure that leading up to the holiday, your dog has been exposed to some louder types of music so that this does not add to their stress level. This is often a great trick to not only drowning out the blasting pops of firecrackers, but can also relax their human counterpart so that they feel more calm too. Make your own aromatherapy spray with a few simple ingredients. When you craft this at home, you will be able to find the right balance of ingredients to ensure the potency is just right for you and your dog! Perhaps the best part is that when you have made this once, it is easy to replenish and make again for other occasions. Aromatherapy sprays containing essential oils known for inducing relaxation can be used in your dog's favorite place by spraying in the air and even a few inches away from the walls if possible. A few drops of essential oils with water in a spray bottle is an inexpensive way to naturally entice your dog to relax. Shelters often use this around their buildings to help comfort dogs. This is an easy craft that anyone can do to create a wonderful smelling sanctuary for your dog! Mix together and spray outdoors to test preferred potency. Spray in a safe room where your pup will reside in the air or a few inches from the walls. Enjoy and relax! Do not spray directly on your dog. While these ingredients are all-natural, it does not mean the pet will not have an allergic reaction following contact. Have a safe, happy and relaxing 4th of July! >> Check Out Side Kick's Calendar!